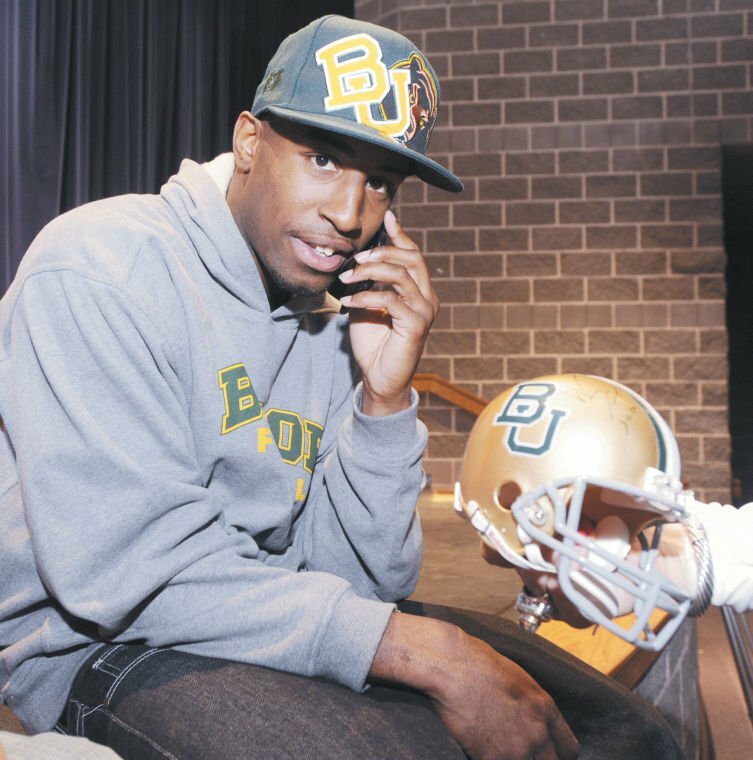 BU recruit Ahmad Dixon talks with his mother by cell phone before a signing ceremony at Midway High School on Wednesday. 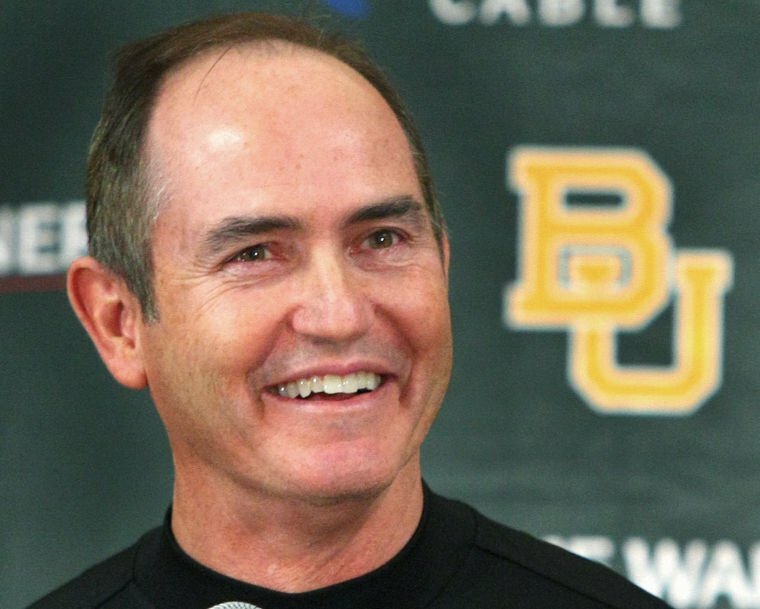 Art Briles smiles as he addresses the media on Wednesday. Briles signed 23 recruits to the football program. Baylor football coach Art Briles started his NCAA national signing day press conference in unusual fashion. He asked Bears’ secondary coach Kim McCloud to backpedal like a defensive back in front of the Baylor fans gathered inside Floyd Casey Stadium. “That’s what the (No. 5-ranked) class of defensive backs in the country looks like,” Briles grinned. Led by highly-touted recruits Ahmad Dixon, Tyler Stephenson and Prince Kent, a talented group of defensive backs highlighted the Bears’ 23-player 2010 recruiting class Wednesday. With a late push on defensive linemen, Baylor finished 39th nationally in Rivals.com’s rankings after placing 55th last year. Rivals.com ranks Baylor’s class of defensive backs fifth nationally. After loading up on offensive players last season, the Bears signed 15 defensive players this year, including six defensive backs and six linemen. ESPN.com ranks Midway’s Dixon as the No. 3 safety in the country and Lancaster’s Stephenson as the No. 14 cornerback. Kent, a defensive back from Hargrave (Va.) Military Academy, is rated the No. 10 overall prep school recruit by Rivals.com and is already enrolled at Baylor. Landing Dixon was clearly the coup of the class, and could pay dividends for the Bears in future recruiting classes. Though he visited Oklahoma State over the weekend and was still reportedly getting calls from schools like USC and Tennessee until the last hours, Dixon stuck with his pledge to the Bears. While Dixon, Stephenson and Kent were four-star recruits, Briles was also happy to land Katy safety Sam Holl, Lawton (Okla.) MacArthur defensive back Tuswani Copeland and Abilene Cooper cornerback T.C. Robinson. While Baylor received most of its commitments from defensive backs early, Baylor made a late run on defensive linemen in January. Sulphur Springs defensive end Kedrick Dial switched his commitment from Texas Tech after the Red Raiders didn’t hire defensive coordinator Ruffin McNeill as head coach after Mike Leach was fired. Jefferson defensive end Clarence Lee switched from Houston to Baylor, while tackle Dominique Jones of Midwest City, Okla., de-committed from Arizona. Baylor got a last-minute pledge from defensive tackle Sean Watson of Panama City (Fla.) Rutherford High School after he switched from Florida Atlantic. Rounding out the defensive linemen are Blinn College NJCAA All-America end Anthony Gonzales and Baytown Lee tackle Xavier Ruben. Briles also likes the trio of linebackers Baylor signed, including Big Spring’s Matt Ritchey, Austin Westlake’s Bryce Hager and Kingwood’s Robert Singletary. Hager is the son of former Texas Longhorns All-America linebacker Britt Hager. Baylor continued to build its offensive line by signing Allen’s Luke Burleson and Baytown Lee’s Tim Smith. Two other prospects — Connally High School’s Troy Baker and Navarro College’s Robert T. Griffin — are enrolled at Baylor this semester. Though Baylor didn’t focus on signing offensive skill people, Briles believes receivers Eddie Johnson of Midlothian and Antwan Goodley of Midland have great talent. Running back Isaac Williams, a transfer from El Camino (Calif.) College, is already enrolled at Baylor. One of the most intriguing signees of the class is Henderson quarterback Tyrell Jenkins, who is also a highly touted pitching prospect that has been projected to be taken in the early rounds of the June major league draft. If he comes to Baylor, he wants to play football and baseball.